I am addicted to spice. Then, I started craving Thai food. The beauty of Thai food lies in their adventurous usage of unique blends of spices and flavours. Lemon grass, tamarind, Thai basil, cilantro, and the different red/green/yellow curries. 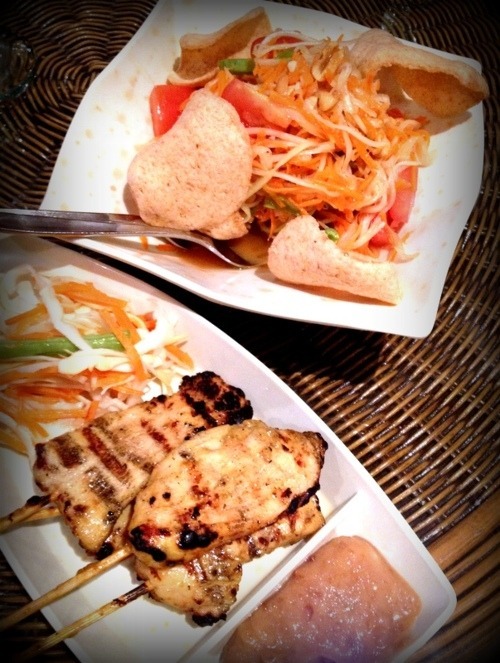 The aroma of Thai cooking is simply seductive and irresistable. 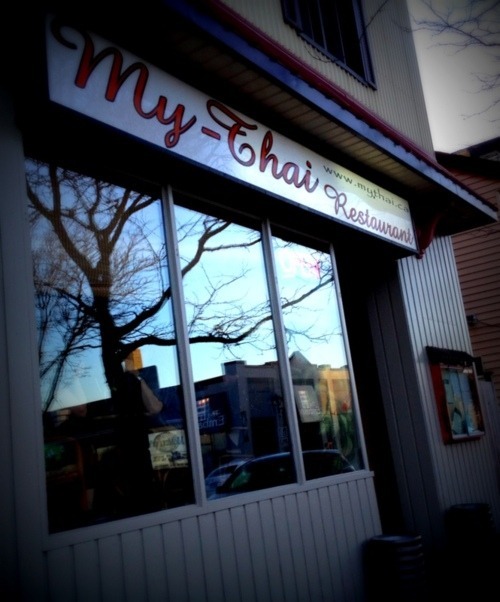 I saw the first My-Thai in Hamilton, but did not have a chance to try then. Hence, it was a pleasant surprise when My-Thai opened a branch in Waterloo. According to their website, they were voted the best Thai restaurant in the Hamilton Spectator Readers’ Choice award for a few years. Since then, the owners have been aggressively expanding the franchise within Southwestern Ontario. 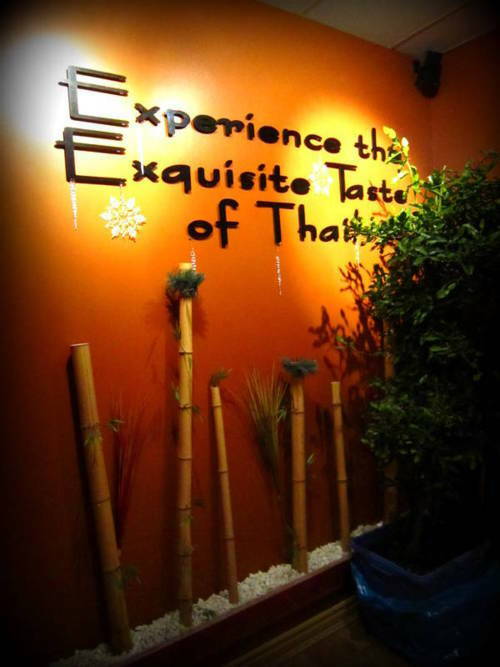 Unlike other restaurants with a Viet-Thai combined theme, I like the way My-Thai focuses their niche on traditional Thai cuisine, with several original recipes. Amongst the many different ethic curries (Indian, Japanese etc. 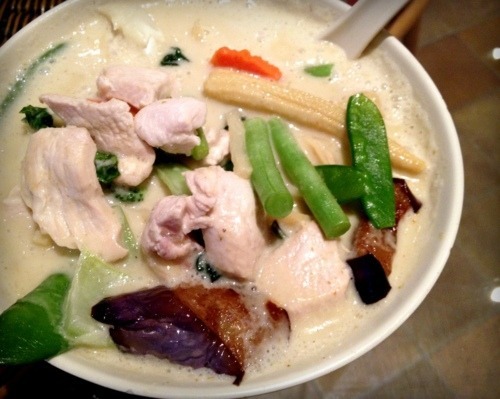 ), the distinct factor of Thai curry is the coconut milk base. Contrary to popular belief of coconut milk being unhealthy, it is actually really good for your heart! Coconut milk is high in saturated fat (87% fats, 10% carbs, 3% proteins), but it is much healthier than other saturated fat products. This milk is made up of short-chain and medium-chain fatty acids that the body quickly turns into energy instead of storing as fat. Therefore, although it is high in saturated fat, coconut can aid in loosing weight! The main saturated fat that it contains, lauric acid, is also found in mother’s milk. In fact, coconut milk is close to human breast milk in its pH, and fat and nutrient content. Coconut water even measures the same pH as human blood. So this fat is easily metabolized by the body and has been shown to promote brain development and bone health. It also has important anti-carcinogenic and anti-pathogenic properties. Coconut has not been shown to increase cholesterol levels or heart disease but rather to lower cholesterol and raise HDL in some people. It is only when the fats in coconut are hydrogenated and turned into trans fats that they become harmful. In fact, cultures where coconut is abundant in the diet have been found to be almost free of heart disease. Delicious AND good for you! Double score! I borrowed an interesting Thai cooking book from a colleague, titled Simply Thai Cooking by Wandee Young. According to Wandee, only the unsweetened and not homogenized version must be used for Thai cooking. The fatty solids will be separated from the liquids, so when using one cup at a time, take some solids and some liquids, then blend them into a cream when heating. For those (like me) who are confused with the difference of red/green curry, Wandee says that red curry is hot and lusty, while green curry is even hotter – based on fresh, green chillies. That book is an interesting read. 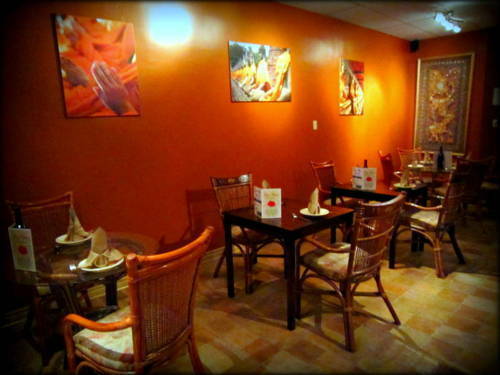 Undeniably, the decor accentuates the rich Thai culture, and clearly translates the thought and effort of My-Thai’s owners to ensure a cosy ambiance for the restaurant. If you are peering in from King Street, the place looks rather small with only a few tables. However, there is actually an extended area at the back of the restaurant, well hidden from pedestrians. I typically prefer to be seated at the back, since it is brighter and spacier. That might also mean less attention from the servers if you desperately need a refill. The Satay was juicy and tender. The cucumber salad was refreshing and tangy. The peanut sauce was creamy and tasty. Wonderful dish. The papaya salad looked lovely, but was a little too drenched in dressing. Our server promised a slightly spicy salad, but it was a tad too sweet with no spicy kick. The Emerald Green Curry was not spicy at all! It was creamy and very sweet. Although slightly disappointed with the spice level, I could not resist the tasty curry and finished every single drop of this delicious velvety broth. 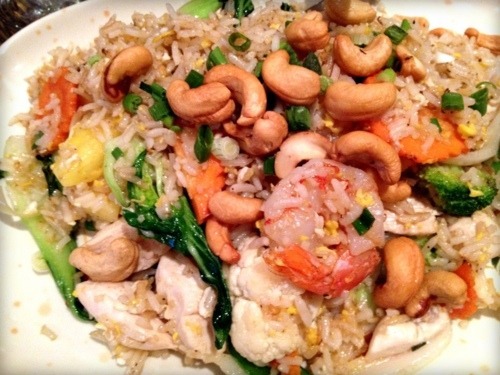 The pineapple fried rice had generous servings of cashews and chicken, very moist and tasty plate. Having pineapple in a savoury dish brings it to a whole new exotic level, kind of like my favourite Hawaiian Pizza. I’ve seen pineapple fried rice served in a half pineapple at some restaurants, and was disappointed when I did not see that at My-Thai. It is a creative way of presentation, isn’t it? 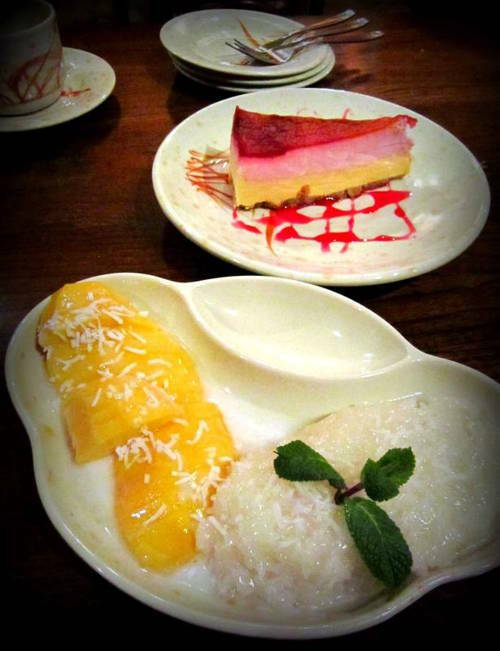 The cheesecake was not memorable, but the mango & sticky rice combo is a classic Thai sweet which they executed perfectly. Peel and cut banana into 1 inch/2.5cm thick, oval pieces. Add banana pieces into coconut milk. Lower heat and cook for 3 minutes. Do not stir – if stirred coconut milk will darken and oil from milk will rise to the top. Remove when bananas are softened. Can be served hot, or chilled.